Out of the two best pet insurance providers on our list, Petplan and Healthy Paws were in a neck-and-neck battle to see who was going to come out on top. Petplan lost by a slim margin, and could actually be recommended higher than Healthy Paws in some circumstances. While Petplan boasts a 30-day claim repayment structure, most claims are actually paid out within 5 to 14 days, making them some of the fastest out of all the companies we’ve reviewed. One area where Petplan could work on improving is through notifying customers about any potential future premium increases. Some of the policies they provide are also a bit questionable. For instance, to have an incident covered, you must attend the vet within 48 hours of noticing the symptoms in your pet. If your pet gets sick on a Friday night, you could be denied coverage for waiting longer than the 48 hours for the vet to open on Monday morning. You also must take your dog for annual wellness visits to make sure that your coverages are going to be applied to any claims you submit. That means you could be paying your monthly premiums without any problems, only to find out that your pet may not necessarily be covered because they haven’t had their annual wellness visit. That means you must make sure to take your pet to see the vet every year, like clockwork. Failure to do so could result in your claims being denied. Wide Range Of Coverage: The reason Petplan scored so high on our list of insurers is the wide range of coverage types that are available. Affordable, Comprehensive Policies: Petplan competes on the pricing of monthly premiums, while still providing enough coverage to properly protect your pet. Petplan Rewards: Each month, Petplan policy holders are able to earn rewards, gifts, and treats. Everything from gift cards, to fetch! Magazines are all available only to policy holders. Covered For Life: Once your pet is enrolled in a Petplan policy, they are qualified for life, and you never have to worry about your coverage being dropped due to age or an onset of an illness. If your pet is predisposed to having genetic or hereditary conditions due to breeding or another outside cause, most companies would turn down your coverage and never issue a policy to begin with. Petplan, however, will issue the policy and cover these conditions. Along with hereditary and congenital conditions, Petplan also covers chronic illnesses with no claim limits. In our research, one of the biggest aspects that customers reported was the amazing level of support they receive through Petplan. When you purchase your policy online through Petplan, you can receive a 5% discount on your monthly premiums. 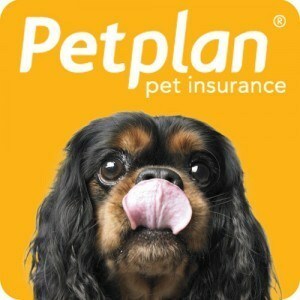 If you have multiple pets that you need to insure, Petplan is a great company to go with. Discounts are offered for multiple pets, where other insurers will charge you the same premiums, regardless how many pets you insure through them. A lot of pet insurers don’t offer prescription coverage. That means you’re going to be out of pocket for the full expense, and those expenses can quickly add up. Petplan, however, offers extensive coverage to make sure you’re not coming out of pocket, once your deductible is paid. If your pet requires ongoing coverage, you don’t have to worry about having claims denied because the payouts are beginning to add up. Petplan will provide you unlimited lifetime coverages, as well as no limits on incidents that may need repeat visits. Getting in touch with someone is easy. By using the Live Chat system on their website, you can avoid tapping your way through different numbers and menus while you’re trying to get someone on the line through a 1-800 number. Petplan has built a huge name for themselves in terms of how quickly they pay claims. While the guarantee at least a 30-day payment schedule, customers have reported that most claims are paid within one to two weeks, making them some of the fastest in the industry. Whether you need to pay your premiums, check in on what your policy includes, or make sure that you can easily submit a claim and check in on its progress, having a mobile app available is a huge time saver, and not many companies can offer it. One of the biggest reasons claims are denied through Petplan is the fact that your pet hasn’t had their yearly checkup. Petplan does this to ensure that any issues that may come up with your pet are caught sooner than later. To avoid this, make sure that when January 1st hits each year, you are getting your pet in for their regular checkup. Like most other insurers, Petplan will make you wait at least 2 days before you will be covered for illnesses. Another reason Petplan uses to deny claims from being paid out is the fact that you’ve waited too long to get your pet in to have their issues addressed by the vet. If you wait more than 48 hours, the required procedures to get your pet in better health again could dramatically begin to stack up. To avoid paying out extended amounts, Petplan requires that you visit the vet as soon as you start seeing symptoms of your pet becoming sick. Petplan has quite a few different types of illnesses that they will exclude from your policies. Before you purchase, you need to go over the policy and make a determination on whether or not a problem that is associated with your breed of pet is actually inside of those excluded treatments or conditions. As your pet grows in age, your premiums may be subject to increasing. While they’re not completely transparent about how often these increases happen, or how much each premium increase is going to cost you, Petplan has been transparent about the fact that they do rise over time. Petplan made it to the #2 spot on our list, beating out a lot of other decent pet insurance companies. Their level of customer support, speed of claim payouts, and the fact that they take customer service to a new level helped them achieve this. However, you need to be aware that your premiums will rise over time, and that you need to get your dog or cat to the vet each year for a yearly checkup. Likewise, you need to visit a vet as soon as you notice your pet beginning to show symptoms of being sick, or you run the risk of having your claims denied.